The Artist Box has a wonderful craft room with a large table. This space can be used for various craft or art projects. The craft room can be rented for an hourly rate. Ideal for Boy/Girl Scout groups, 4-H groups, and other organizations. Have a art birthday party. 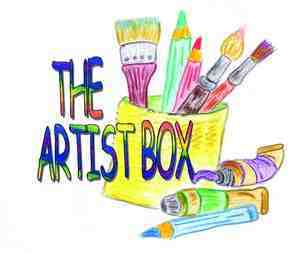 The Artist Box will provide the art project, you provide the snacks. Rates depend on craft and number of guests. Call for rates. How about a bridal shower? Have your girlfriends do a tasteful craft. We do Cocktail & Canvas parties, or purchase some bisque-ware ceramics and have a glazing party. Have a pottery party and learn to use the kick wheel, or hand-build using the slab table. Clay and glazes will be provided and are included in the fee. Studio space available for a reasonable rate -- $5.00 per hour. Materials fees are extra. Clay is $2.00 a pound for a finished greenware piece. Glaze price will vary depending on size of the piece. Fire fee is $5.00 per piece per fire. Enter information below to reserve the craft room. Ronda will get back with you to confirm and discuss rates. Thank you.